The 95th New York, along with the other regiments of General Cutler’s Brigade marched with General Reynolds and the 1st Corps to Marsh Creek, outside of Gettysburg on the night of June 30th. With the opening sounds of battle on the morning of July 1st, Reynolds directed the Brigade to march on the double quick to support the position of Buford's Cavalry who were fighting a delaying action against superior Confederate forces, just to the West of Gettysburg. Upon arriving at Seminary Ridge, the 95th advanced along with the 14th Brooklyn to McPherson's Farm in support of the Iron Brigade who were advancing against Archer's Brigade, entrenched to the west of Willoughby Run. With the threat of the advance of Davis' Brigade along the railroad cut, the 95th and the 14th Brooklyn were ordered to change fronts and advance north to the RR cut. As they crossed Chambersburg Pike, they met the 6th Wisconsin who had been ordered to support the movement by General Doubleday. Major Pye of the 95th NY and Col. Dawes of the 6th Wisconsin met in the field North of the Pike. Dawes said "We must charge!" Pye responded, "Charge it is! We are with you!" With that command, Pye waived his sword above his head and shouted "Forward, forward, charge!" All three regiments then advanced north to the RR cut with the 14th Brooklyn to the left (west), the 95th in the middle and the 6th to the right, (east). They arrived at the RR cut at virtually the same time under tremendous fire. Many men were lost along the advance. The 95th was able to check the retreat of Davis' Brigade by holding the confederate troops who entered the cut. The regiment fired down from above, right at the lip of the cut. The 14th Brooklyn halted the Confederate's escape to the west. The 95th stood at the height of the RR cut and shouted down to the Rebs to drop their weapons. The 6th Wisconsin closed the Confederate escape to the east. It is at this "Moment Of Valor" in history, that Mr. Martin captured the action at the RR cut. The image shows the 95th New York at the climax of the battle, enduring the voracious fire from the Confederate troops while ordering their surrender. " 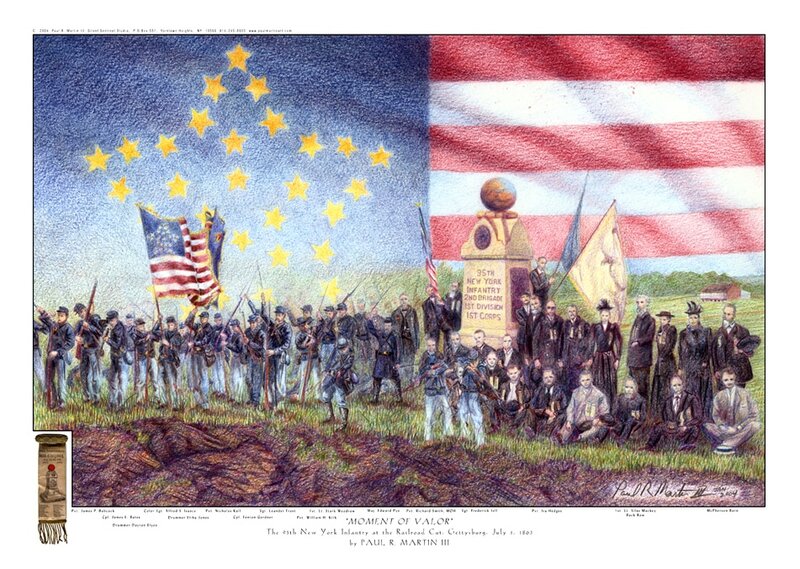 The dominant image in “Moment Of Valor” is the battle flag of the 95th New York Infantry Regiment. On the morning of July 1, 1863, it was that flag that the troops from Rockland County carried across the bloodied fields to the Rail Road cut. Thirty years later they returned with the same flag to Gettysburg, to dedicate their monument and memorialize their comrades in arms who sacrificed their lives for the preservation of the Union. The flag was returned to Rockland and placed on display at the Major Pye G.A.R. Post in Haverstraw. Sometime around the turn of the century, as the veterans were slowly dying off, the last surviving member of the 95th New York donated the flag to the Bear Mountain Museum. It remained on display for several years. At some point in time it was removed from display and placed in storage where it was quickly forgotten. In 1995 a park maintenance man was cleaning out a State storage facility on Iona Island in the middle of the Hudson River. He happened to notice a long oak case, with a broken glass front. It was covered with bird droppings and several small rodents had nested in the box. The astute worker realized that there appeared to be a furled silk flag in the case. He immediately contacted the County Sheriff, James Kralik, a noted Civil War historian and member of several Civil War preservation organizations. The Sheriff arrived with a deputy and upon further inspection concluded that they had found the long lost National Colors of the 95th New York. A concerted fund raising effort was conducted to acquire money to have the flag restored. On Veterans Day 2002, the restored National Colors of the 95th NY were rededicated at a ceremony at The Fireman’s Training Center in Pomona. It remains there on permanent display for all to view and honor.